We went in search of an oversized tree, cranked up the cheesy tunes, cracked open some bubbles and spent the afternoon stringing up lights and debating between different baubles. I baked a batch of gingerbread (which was delicious, but not quite perfect enough to make an appearance on the blog just yet) and the flat was filled with warmth, laughter and the scent of spices. Some of you may feel it’s a little too early to start the season’s festivities. My Mum always refused to even think about decorations until just before my brother’s birthday on 19th December, claiming that they felt too tired by the time Christmas Day came around. But since Carnivorous Boyfriend and I both head home for the holidays, it seems a shame not to start early and make the most of our little flat while we can. We don’t have a huge number of decorations other than the tree, but a wreath always goes up on the front door. Last year we hammered in a nail to hold it in place which, once the wreath was removed, turned into a bit of a booby trap, spiking Carnivorous Boyfriend several times a week as he attempted to open the door whilst holding his bike. Somehow we never got around to removing it which means that this year the wreath was up in seconds: next January we really must remember to take it out . . .
With wreaths in mind, I decided to make something festive to mark the start of advent. After baking up an enormous batch of cookies to send out as part of The Great Food Blogger Cookie Swap (recipes coming on 12th December so please do come back to check them out then), I had a cupboard full of half-opened packets. 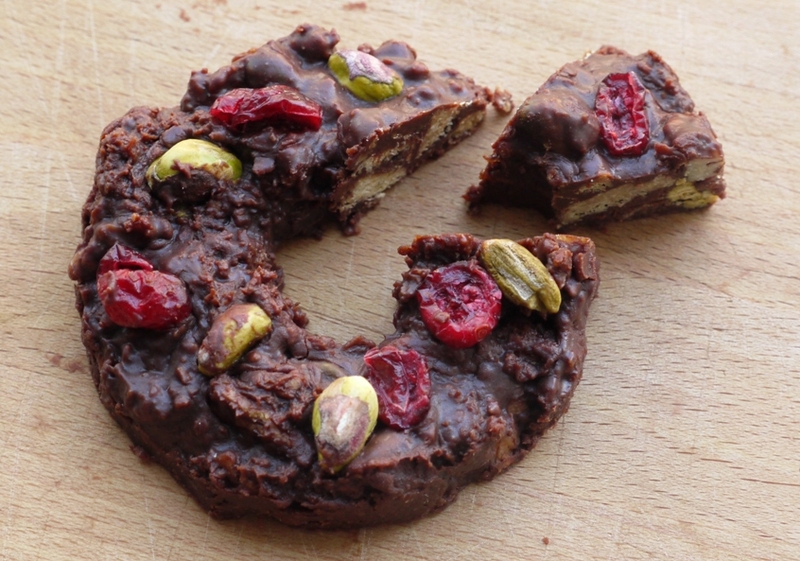 With juicy dried cranberries, bits of chocolate, pistachios and pecans, chocolate biscuit cake seemed the most sensible, simple way forward, shaping it into individual wreaths for a Christmassy twist. This is a bit of a kitchen sink recipe in that you can include pretty much anything but. 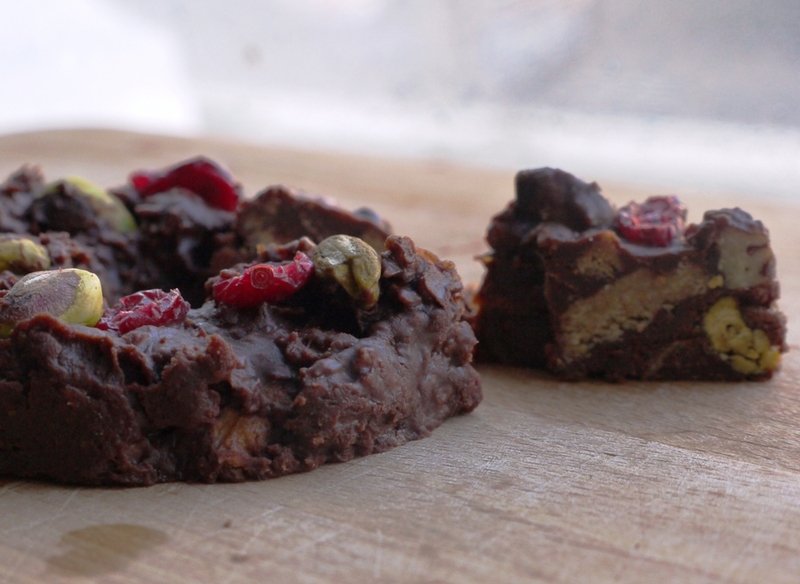 I’ve used dark chocolate, milk chocolate orange segments (mine, not Terry’s), digestive biscuits, pecans, pistachios and cranberries for colour. I also threw in some crunchy feuilletine (left over from these peanut butter chocolate cheesecake bars) but you could substitute with any kind of biscuits (amaretti or cantuccini add a lovely festive flavour), toasted rice or cornflakes. Raisins, sultanas and other nuts would work well and a few chunks of creamy white chocolate would create a nice contrast. Serve each wreath in slices or eat it all to yourself if you’re feeling greedy! Although I’ve included a photo of a wreath hanging on the tree, I’d actually suggest storing them in the fridge due to the butter content. Plus, if your tree is anything like ours and within plucking distance of the sofa, limiting the number of easy access free-hanging treats might be a good idea if you want to fit into that little black dress come Christmas party time. 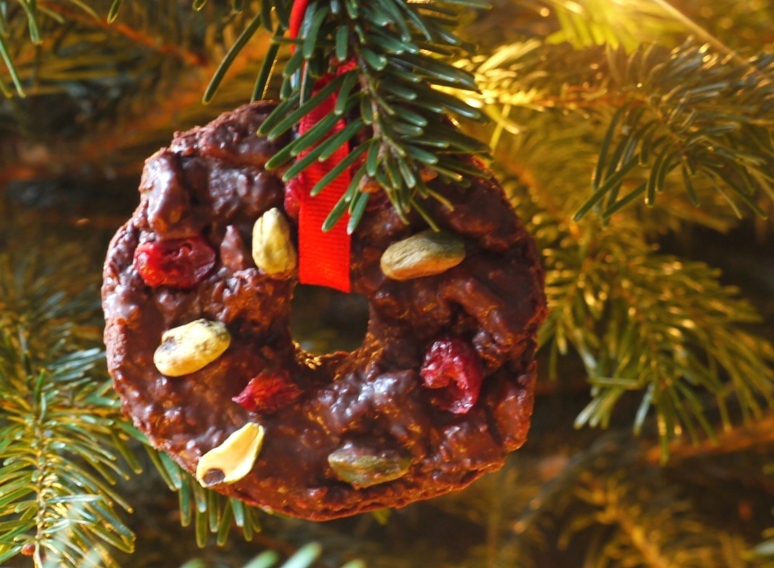 If you’re looking for something easy and festive to make this Christmas, do give these chocolate wreaths a go. And if you’re not quite ready to start the celebrations yet, you can always be a boring scrooge and mould the ingredients into a loaf tin. Just saying. Line two trays with baking parchment or a non-stick silicone mat. Melt the chocolates in a heatproof bowl suspended over a pan of boiling water. In a separate saucepan, melt together the butter and golden syrup, then combine with the melted chocolate. Stir the egg into the chocolate mixture to pasteurise. Fold in the feuilletine, digestive biscuits and nuts then pop the mixture in the fridge to firm up for half an hour or so (don’t leave it too long or the whole thing will set). Place a metal ring mould onto the baking parchment and fill with dollops of the mixture, making a hollow in the centre of each to form a wreath shape. Repeat to make eight wreaths. Stud pistachios and cranberries into each wreath then return to the fridge to firm up completely. Tie a ribbon round each wreath, if desired. How festive and very adorable! So sweet! They would make great gifts. That’s a very festive idea, nicely executed. This is a genius idea – chocolate biscuit cake is one of my favourites and I love how you made it all festive! Oh wow, Loaf! What a lovely, delicious and dangerous idea… I want! We put our tree up yesterday although it wasn’t quite as relaxing, with two little ones trying to put all the decorations on a single branch 🙂 If only you could really hang these adorable little wreaths up on the tree. They would be eaten in no time though. Kathryn – chocolate biscuit cake is the best, I could eat it all day every day and never get bored (possibly). these are amazing! I’m going to have to have a go at these! They look gorgeous and, more importantly, delicious! Don’t you just love this time of year? These wreaths are adorable and so festive! Love them! Wonderful, I have found a perfect festive addition for my ‘Heath Robinson’ food hampers for friends and family this year. Thank you! Jenny – hope you like them! Victoria – that’s definitely the most important thing! Food & Forage – glad to be of help! Silver Screenings – haha, I know what you mean! Oh my… I can only imagine all of the delicious baking that’s going on at your place this month. Jealous!!! So funny what you said about your mom waiting until after your brother’s birthday to set up the tree. We do the same thing at our house: my daughter’s birthday is the 16th and we don’t do anything until after. By then it almost feels too late. Glad to see you are getting a good start this year! I love edible decorations. They are definitely the best kind of decoration, and your wreaths look divine. These are too cute. Too cute. They’re perfect for gift-giving, too!. Narf – haha, yep, sounds like the fridge would be the perfect place to hide them! Bianca – 1st December is our rule – any earlier and it feels like too much, but I do like a good month’s worth of celebrations. Erin – it’s so hard when birthdays are close to Christmas, I think my Mum wanted it to feel like my brother’s birthday was still all about him! Jennifer – thank you! Loved the look of the wreath you made too. 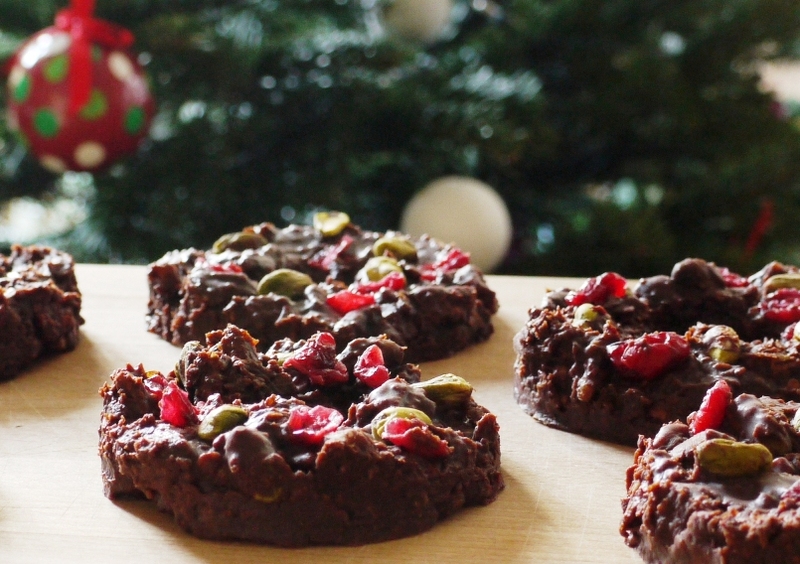 Sacha – definitely, although this year I’m thinking of making Christmas pudding and gingerbread truffles. These are brilliantly festive and I love that you can hang them on the tree too! Ah, now I understand the biscuit cake reference in your comment. I was a little behind on my reading, so just got around to this post. 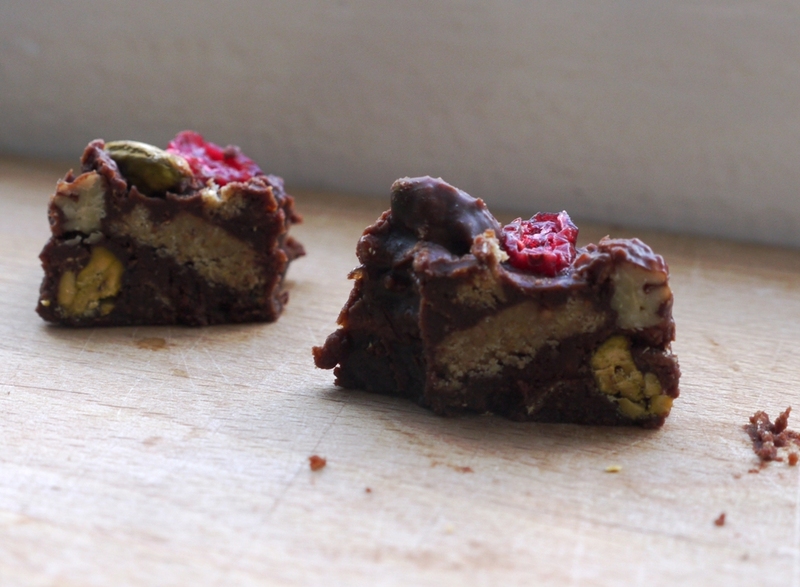 This is another great variation to the biscuit and chocolate combo… and so pretty too.